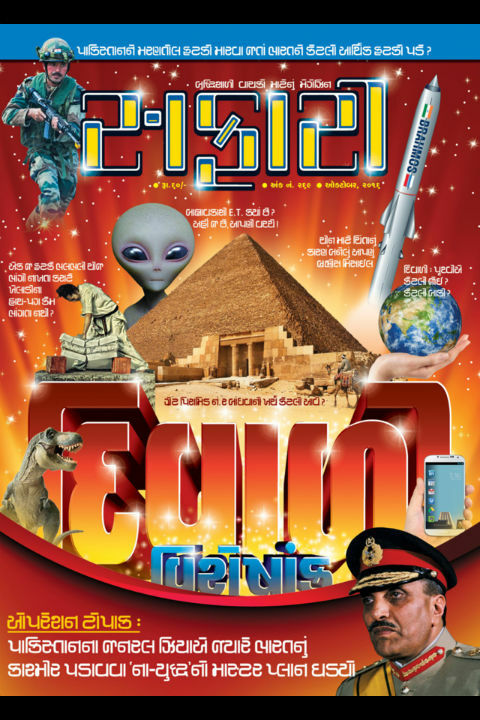 October 2016 issue of Safari – a knowledge and science magazine from India – Gujarati edition – was a little late. It is the Deewali (or Diwali) issue and happens to contain more reading material than it used to carry, so this couple of days delay is fine 🙂 And, here are our personal views and reviews for the same. If you look across magazines and/or newspapers across India these days, chances are High to find articles about Indo Pak tension and the wars happened between the countries in past. Be it about recent surgical strikes, Kargil war, Pathankot attack or the wars happened in past. The content found in Safari is however unbiased and bravely talks about the facts only. It is not the kind of magazine which plays with content to grow readership. It rather keeps the facts intact, and accurate to best of the author’s knowledge. So we recommend reading the articles about various issues ongoing since years in this arena, in Safari. The cover page is quite effective and it uses good color combination. All the major articles in the magazine issue are mentioned on the cover page quite intelligently. The article about Operation Topac (which was started a long ago by Pakistani Army Chief after defeat in war against India) provide in-depth information about it. The article also explores brilliantly that how war tactics are used and describes the proxy war genre. The author’s research deserves appreciation. Of course it is courageous to write such article. But what we found as even better side of the article is, rather than joining the bandwagon of articles and news about recent terrorist attacks and its retaliation actions; the author tried to find the root of the cause to find when, where and how it is started. Without knowing the background and roots of anything, it is not possible to resolve it fully. We need to do the right things at right time. We need to learn from the history to know what works and what not, and implement actions accordingly. The writing style of the author makes the article worth reading. Brahmos Missile is in talks since a while. It is one of the best weapons India have developed. It is considered as one of the most fearful weapon. Due to it’s super speed, for the enemy, it is not possible to stop it midway. There was an article about the same missile in the some of the past issues of Safari as well. Though none of the information is just reprinted. Everything is written in the perspective. This article is written actually as the answer of the super question of the month. It definitely contains all you required to know about this supersonic missile. What is the technique used by an experienced Karateka which makes him/her able to break wooden sheets, bricks, ice bricks etc, without getting them themselves injured? Does this question raised to your mind ever? If yes, then you will definitely like to go for this article. Fifteen members of the International Budo Association led by Phil Milner demolished a 6 roomed early Victorian house at Idle, Bradford, Yorkshire by head, foot and empty hand in 6 hours on 4th Jun 1972. Seems like unbelievable right? Often you got to read news about such shows happened in an auditorium or some stage. You see the hard-to-believe use of Karate and other Martial Arts techniques in some movies also. But, it is hard to read about the use of the same techniques in real life to accomplish a real task. The article however talks less about the techniques used in Karate. It might be due to the fact, that Karate is an art, and it requires dedicated efforts and time to get excellence at it. But a common reader may want to know more about it. Overall a nice article though. Please provide information about various units of Indian Army like division, brigade etc. Describe the numbering system of Indian denomination. Provide information about the diamond planet. How much amount of ice of south pole is diluted per year due to Global warming? Is it possible that all the ice would be converted into water, leaving no more ice there? What effect it have on the water level of various oceans? Why Vampires cannot see through daylight? How is it possible to charge a mobile phone wireless? It is mentioned in a newspaper that during the wildfire of May 2016 in Uttarakhand, some animals and birds ran/flew towards the jungle (rather than running away from there), is it true? What is the reason of such mysterious behavior? Nowadays snow sprays are used widely in various parties, what are they? Are they harmful? Why we have most body parts (and organs) available in pairs? When PM of India addressed the nation on Independence Day 2016, he talked about Baluchistan. It was live telecast-ed there as well. How was it possible? What happened to the Pomato plant (a plant developed using biotechnology, which made the farmers able to get potato and tomato both from same plant)? How much distance is covered by various robotic vehicles sent by NASA on Mars? What is the future of Gujarati language, as most of the parents prefer their children to go English medium schools? Why the highest temperature is noted between 3:00 and 4:00 pm despite of the fact, that the Sun is on the top at 12:00PM? What is reason that we sneeze twice or thrice in a sequence? When you download data in any electronic device, will it get heavier? The editorial of this issue is definitely worth read. It talks about an intelligent plan by General Krishnaswami Sundarji (aka K. Sundarji) which was not executed. The possible outcome could have made the current circumstances different than what they are. A very thoughtful and responsibly written editorial. We recommend you to read it. Definitely a magazine issue worth going for. It gives you best value for money and time you spend.